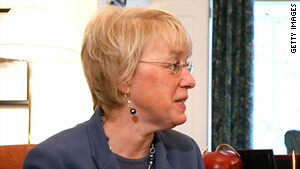 Sen. Patty Murray chair's the Senate Health, Education and Labor's subcomittee on Employment and Workplace safety. Washington (CNN) -- Sen. Patty Murray blasted BP on Thursday for failing to attend her subcommittee's hearing on oil and gas worker safety. "Honestly, I find it very outrageous that even after an accident that killed 11 workers, BP is not putting a high enough priority on worker safety to send a representative to a hearing specifically focused on protecting workers in their industry," the chairwoman of the Senate Health, Education and Labor's subcommittee on Employment and Workplace Safety, said. And she offered a warning to the company: "I am not going to stop working to get answers from BP." Murray, a Democrat from Washington, not only held BP's proverbial feet to the fire -- but examined ways to ensure that oil and gas workers are fully protected going forward. Jordan Barab, the Deputy Assistant Secretary of Labor, Occupational Safety and Health at the Labor Department, testified that lessons are not being learned. "The oil and gas industry must learn from its mistakes. Almost all of the recent catastrophic incidents and refineries were repeats of earlier mistakes which lessons could have been learned," he said. Barab said investigators are finding a significant lack of compliance during inspections of refineries. "Time and again our inspectors are finding the same violations in multiple refineries, including those of common ownership and sometimes even in the same refinery," he said. "These are other incidents involving close calls, serious injuries and fatalities are clear indication that essential safety lessons are not being learned." Murray cited past incidents that she said drove her point home: 11 workers were killed at the Deepwater Horizon on April 20; 15 workers died and more than 170 were injured at the BP Texas City refinery disaster in 2005; seven workers died at the Tesoro refinery fire in Anacortes, Washington, in April. Kim Nibarger, a health and safety specialist with the United Steelworkers, was present at the Tesoro fire and discussed his personal experiences. "I had just arrived at my parents home in Anacortes, Washington, in the early morning of April 2 this year when I heard an explosion and knew immediately that something bad had happened at one of the local refineries," he said. He blasted the oil industry for being like a "fox guarding the hen house." "I think a prudent individual understands that when you write the rules to govern yourself, you typically are pretty lenient," Nibarger said. Sen. Johnny Isakson, the ranking Republican on the subcommittee, noted his support for offshore drilling but warned that he didn't want the Gulf tragedy to become what the Three Mile Island nuclear leak became to the nuclear industry. But he said that it doesn't mean Americans should tolerate or accept the loss of life "or less than the maximum amount of security" so this doesn't happen again.